Politics is a difficult topic to write about in the present time as there is so much acrimonious debate in the political arena. Most people in the US align themselves with a political party, either Republican or Democrat, and entrench themselves in their respective positions. Yes, there are a few green party and libertarians out there, but the majority are bent on identifying with the conservative or liberal ideology associated with their party. While there is no perfect fit, we are more than willing to shoehorn ourselves into a category. 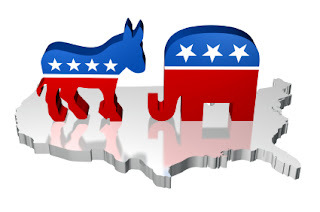 So, what is really at the nature of the rift between republicans and democrats? And is it real, or maintained and promulgated by the political leaders to establish their respective constituency? Some can't believe that any intelligent person could be anything but a conservative. After all, one of the great leaders of the past century, Winston Churchill, famously remarked,"Show me a young Conservative and I'll show you someone with no heart. Show me an old Liberal and I'll show you someone with no brains." There is actually some debate as to whether Churchill actually stated this, which is unfortunate because it is such a good line. In any event, I have long since given up the idea that intelligence factors into the equation. One's political affiliation seems to be a much more guttural inclination. I think perhaps that what is really at the heart of the matter is whether you believe in man's capacity for good or his predilection toward evil. Here we delve into faith a bit, but even atheists attend the political process. Therefore, to clarify, the belief I speak of may be attributed more to the inner workings of man's thoughts rather than an absolute good/evil embodied as an extrinsic force, or God. In deference to the liberal crowd then, this should provide for an all inclusive discussion. Is man basically good and capable of establishing a social contract to maintain and interact with society yet open to sin as espoused by John Locke, or alternatively is man basically born to wretchedness and sin, needful of active regulation to maintain his status within a society and political system as proposed by Thomas Hobbes. I think that it is important to remember that the tenet of a representative democracy is not the right of everyone to vote, but the engagement of an informed voter who has the capacity and thoughtfulness to understand the issues affecting the society and government's role in said issues. Some of the forefathers of this great nation initially had in place certain rules controlling the right to vote. Among these were that only landowners possessed the right to vote. Considered today, perhaps that may not be practical, but the concept behind that rule is, I believe, that it is the stakeholders of this nation which should determine the direction which we are to take. While the provision of land ownership may be overly burdensome, surely we must consider who has the vested interests of the country in mind when we consider the political process. And while the irony of Hobbes and Locke as it relates to our modern definitions of conservative and liberal thought may be lost on more than a few, I think that maybe the understanding of this statement should be in itself a prerequisite to the ability to vote, for the dichotomies of seventeenth century political theory persist to this day. Let me introduce this to the debate, the bell shaped curve. Many characteristics and/or traits in biologic systems naturally distribute along this curve when plotted out. Applied to human social ethics, we could place on one end of the spectrum the truly evil people of the world such as Hitler while the other end of the spectrum would be occupied by the saints like Mother Theresa. Most of us lie somewhere in between-not yet teetering on the edge of entering the ninth circle of the Dante's Inferno, and not quite arrived in the heavenly realm of Paradiso, but perhaps wandering the mountains of Purgaturio for a time. 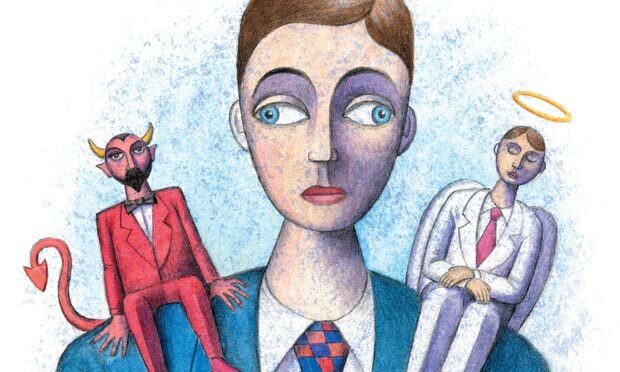 So, maybe it is not whether we are more good or evil leaning, but the choices we make which define our character. All of us are tempted toward what we know to be wrong, but what response do we project toward that temptation. Do we recognize the seven deadly sins and rise above them or give in to them? Therein lies the struggle between good and evil. It seems easy enough, but it is a truly difficult thing for some. Without inflecting too much of my personal beliefs, I would like to introduce the Examen, a daily practice of prayer from Saint Ignatius. Regardless of your personal beliefs, this is basically a reflection on the day's events, a way of looking at them in a spiritual light and projecting a positive outlook. Now when it comes to the choice of gin vs vodka martini, nothing could be less ambiguous. The Martini is made with gin and vermouth-period. If you place vodka in a glass and mix it with vermouth, I'm not sure what it is you've made, but it is most definitely not a Martini! I would be happy to debate the issue with anyone willing to expose their lack of knowledge in this area. When it comes to politics, exercise your right to choose by casting your vote in a conscientious and thoughtful manner, but when it comes to the Martini, it is Gin and Gin only.